Samsung is a company that might be on the #1 among the smartphone manufacturers, but still, it is not able to impress users with its midrange and budget smartphones. This is all due to the competition from Chinese companies like Huawei and Xiaomi that are launching much better phones at the same or even lesser price than what Samsung offers. Still, the company is launching new budget phones every year, and the Samsung Galaxy J8+ is an upcoming J-series phone. We know that the J series from Samsung is all about budget phones with good specifications. 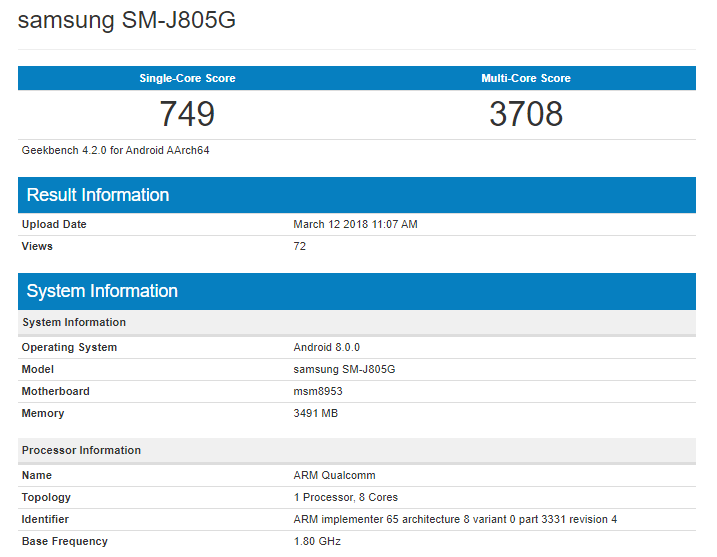 The Samsung Galaxy J8 (SM-J800FN) was spotted on Geekbench a few days back with the Exynos 7870 processor (Yes, Samsung is still using a two-year-old processor!) but the Galaxy J8+ (SM-J805G) is coming with a Snapdragon 450 processor which is a bit better in terms of performance as compared to the Exynos 7870. As the listing above shows, there is 4GB RAM and the phone is running Android Oreo out of the box. On the single core, it scores about 750 while the score of Multi-core is 3708. These scores are slightly higher than the scores of J8 (726 and 3643) which show that the Snapdragon 450 and Exynos 7870 aren’t much different regarding the performance. There could be a variant of the J8 with a Snapdragon chipset, but that isn’t confirmed yet. Stay Tuned for more details.